I’ve been aware for the last year or so that Pluto was heading for my Moon. My Moon lives in Pluto’s house (the 8th house in Astrology), she’s familiar with the territory. But no one can foretell what the Pluto experience will be like… it’s almost always big. That whirly wind, the dust storm, late afternoon November 25th. A few hours later I was coughing convulsively with a high fever, I was BIG sick. Two weeks in bed, I had a serious chest infection. Weak and exhausted from continuous coughing, my breathing muscles feeling bruised. Obviously the biggest sick since I had Polio when I was three years old. I was big time pissed off, big time pissed off. I let a few people know how pissed off I was, I didn’t hold back. My friend and therapist, Ian, commented on the polarity ~ me so often operating from the opposite end. It’s been an interesting journey. I get the sense that it’s the last one of these. I don’t need anymore. I’m now creating my new world, taking myself to my dream. Our masterful Sun sat at the mid-point of Hekate and Ceres in the recent Full Moon in Gemini… illuminating our wondrous sky with her healing glow. Hekate is the Queen of the night, she carries two lit lamps, she meets you when there’s a fork in your road. She brings light so you can see and choose which road you want to take. I came to a point of choice, I was getting comfortable in this angry space; but this space was teaching me too. I needed to choose; give my focus to this choice. I choose to align with the vibration of flow, comfort and ease. This Life ~ such a gift, it’s purpose to enjoy. The transformational energies being released into our atmosphere at present are great. Let go, let God and Goddess … allowing the flow, trusting what I believe, feeing what I love fo feel. The recent rains have brought relief, to us all. About a hundred millimetres, the tanks are full, the grass is green, the garden sighs and the frogs rejoice. A pair of stunning Ravens have been making good use of the birth bath. I’d never seen them at the bird bath except for the last few weeks, I figured it was the dry, they don’t normally come so close. First I thought there was only one, I saw her walking around the garden and the paddock, she became a familiar sight. Then the male appeared. I figured they’d taken up residence near by. 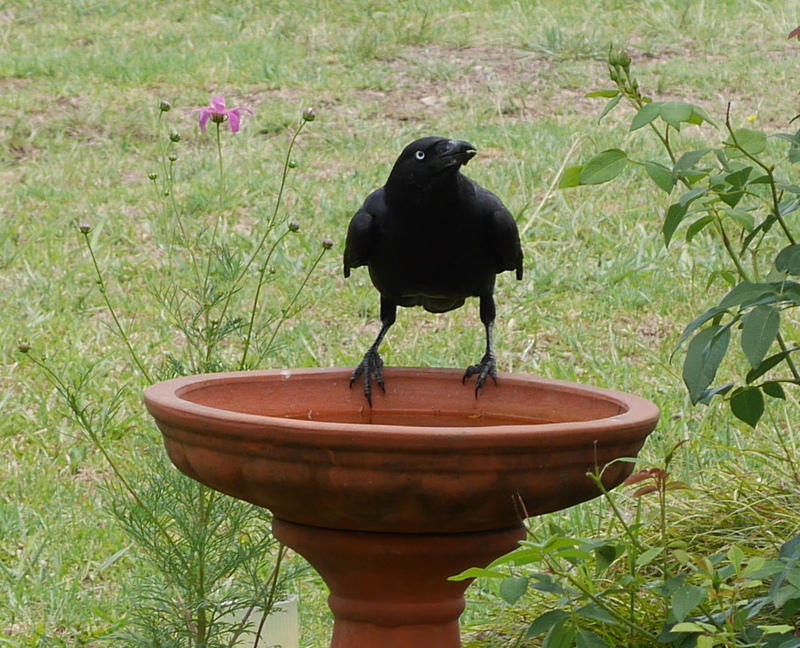 One day sitting on the verandah, the bird bath very close, I watched her carefully. She took her fill of water then flew back to a tree nearby. 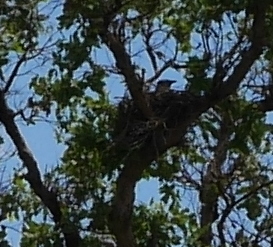 I looked closely, I saw the nest, built in the fork of the highest branches. There was a young family near by. I’ve watched them for weeks now, coming down and getting water, walking around the garden and paddock collecting food, then taking it back to the nest. What a gift. I read they normally don’t have babies after September, due to the risk of dehydration. That’s why they’ve built their nest so close to the bird bath. So happy I could help. 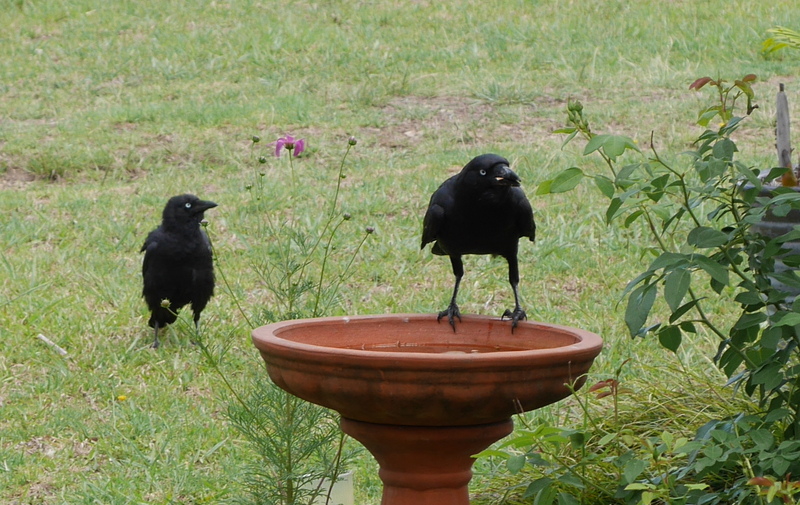 I always keep the bird bath full and clean. It feels a privilege to have them here. Looking at the symbolism of the Raven, he’s said to have a high level of intelligence, he’s flexible and adaptable. He’s known to be a benevolent helper, a bringer of great magick ~ a protector, a teacher, he’s also known as a trickster. The Raven is richly interwoven into Celtic and Norse Mythology. The Wolf and the Raven are often mentioned together ~ Wolf and Raven have an important relationship. The Raven is thought to be the most prophetic of birds ~ ‘the foresight of a Raven’ ~ he was considered a messenger of the Gods. 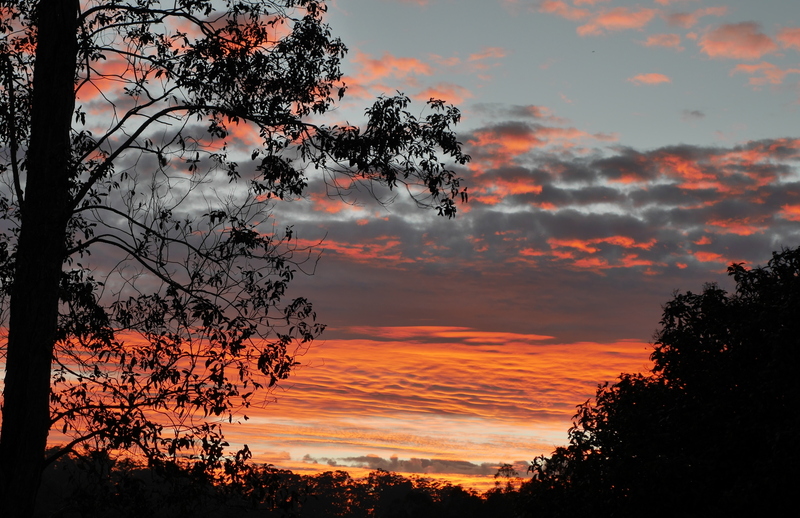 The connection to the Wolf really spoke to me, I’ve had many journey’s with my companion the Wolf, during my Shamanic Baths… my favourite ‘therapy’ by my friend Vicki in the Adelaide Hills. The Wolf has shown me many things, he has protected and guided me. That he’s sent his friend the Raven to visit me in this physical plane has alerted me, I will pay attention. The last two weeks have been difficult, I think the sickest I’ve ever been. Two weeks of almost constant coughing, convulsive many times, bringing up yucky green phlegm from my chest ~ I have a chest infection. Yesterday I was thinking it’s probably the sickest I’ve been since I had Polio. I’ve been in bed for two weeks. A few days I was really concerned, my chest and diaphragm muscles felt awfully bruised, it was difficult to breathe. I’ve had no prior respiratory disease. The major concern was further weakening of those muscles. For people who have had Polio, muscles have been affected due to the death of their nerves. The advice given is not to overextend any muscles, as they don’t have the capacity to stretch that far. Extending will not strengthen it will further weaken, threatening their ability to function. I was really concerned about permanent damage to my breathing muscles. Oh yes, I’ve been well and truly pissed. It was the dust from the forestry workers that created this recent event. I suspect the dust was contaminated with diesel, due to the severity of the reaction. They’ve also been using glyphosate, which is known to have caused adverse effects on the central nervous system, and many other serious ailments, there have been some recorded fatalities. So much anger has come to the surface ~ and you know, it feels good to be angry. At times it feels like generations of this anger have surfaced within me ~ the ancient wound of the feminine. The prosecution during this very long age of Patriarchy. It’s real, it happened and still does to some extent. Enough, line in the sand time… the Woman has had enough. We’re taught to be nice, well lately I haven’t been nice. I’ve been really pissed off. Yeah there are bigger things going on, with Pluto hammering my Moon (in Pluto’s house! ), it was always going to be big. Surviving it was the thing. Having to face the Patriarchal mindset head on, just me… well they’ve been a few very close calls. Yesterday morning I wrote ~ ‘this is the second attempt on my life, the bastards, the bloody Patriarchy trying to kill me’… oh yes it’s all symbolic, happening on another level, doesn’t mean it isn’t real. This war on the Goddess, the Sacred Feminine has been going on for a very long time. It’s nearing its end and the bastards are fighting with everything they have. They can be very nasty… but their time is finishing. Yes we exist in many levels of time. Our body, our Earth reality is here and now, our cellular memories stretch back to ancient times. We get glimpses of future. There is so much we are unaware. We alone can walk our path.